Ragonese's tiramisu is the perfect size for one. It comes frozen, so it won't work for an instant dessert fix, but the dish does defrost pretty quickly in the fridge. And it doesn't taste like it's been frozen at all. This version is heavy on the mascarpone cream, with a solid layer of it on the bottom, a thin layer of espresso-soaked savoiardi (ladyfingers), and more mascarpone cream on top. Then it's liberally sprinkled with cocoa powder. And a little bonus: it comes in a cute little glass bowl that's perfect for all kinds of kitchen uses. Ours hold small amounts of ingredients for baking and cooking and snacks for the kids. You just totally unveiled my favorite little secret with this blog post. 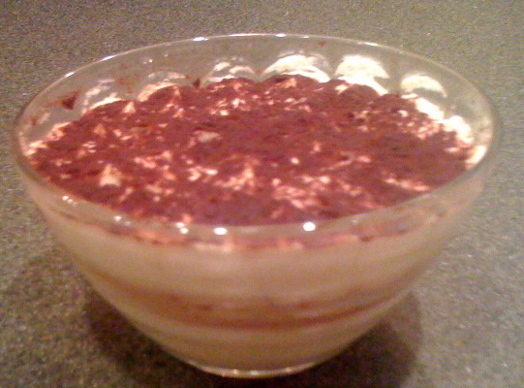 I have been buying tiramisu from the Ragonese for the last few years. I have quite the collection of little glass dessert dishes that come in handy for when I make jello or pudding. From what I understand...it is shipped in frozen from Italy...which is why it is sooo much better than any other I have tried. And once thawed, you'd never know it was ever frozen. I hate when I am impatient and try to eat it when not quite ready-to-eat. Ragonese is seriously one of Albany's best-kept secrets. One of the last things I did before I left for the semester was to grab an Italian Mix from the deli counter, and it's probably going to be the first thing I do when I get back. The sausage there is insanely delicious. This stuff is addictive, but so are many things in Ragonese. When I die, if I go to heaven, I know this tiramisu will be there. And in case I'm not headed to heaven, I'm going to eat a lot of it here. And the bowls are great for so many things. I agree with all the positive comments about Ragonese; the best place in town to get good olive oil, also. But my hands down favorite version of tiramisu is at Avenue A. they make their own thin espresso cake for layering and the filling seems to have a touch of orange or something. It is real homemade and incredible!